Businesses in Sunderland and Darlington that want to explore opportunities to raise finance can now benefit from free business advice from Northstar Ventures. The venture capital firm has partnered with Sunderland Software City and Business Central Darlington to provide informal drop-in sessions to help entrepreneurs overcome challenges to accessing finance. The drop-in sessions will be held during office hours on the first Thursday of every month at Business Central Darlington and the last Friday of the month in Sunderland, starting September. The sessions are designed to help entrepreneurs from any business stage enhance their growth. 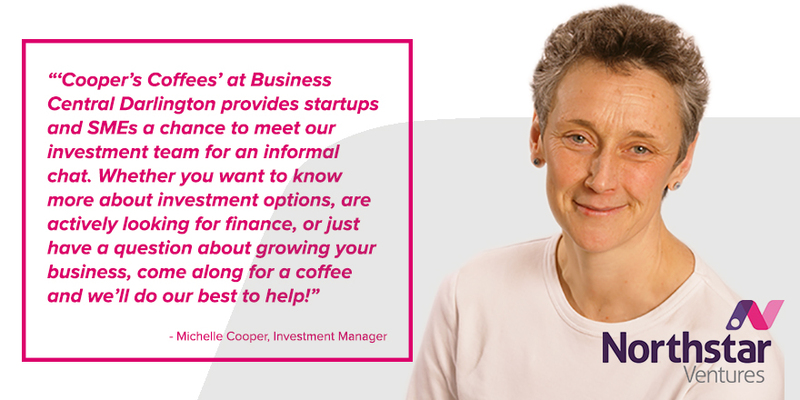 Sessions are hosted by Investment Manager Michelle Cooper, who has over 10 years of experience in evaluating business plans. Centre Manager, Vanessa Wood said: “Here at Business Central we really want to get the message across that we don’t just offer great office space. We want to help businesses nurture and grow and I am delighted at being able to offer the venue to Northstar Ventures for their networking sessions. Billy Webber, Chief Operating Officer at Sunderland Software City said: “Accessing finance and understanding the different routes to funding are integral to starting and growing a business, but can often be one of the areas founders feel most intimidated by.